What Is The Range Of Wi-Fi? Note: The following article is written from a vendor-neutral standpoint. All limitations discussed are not specific to any one vendor and occur across all platforms. Wireless range is impacted by natural elements and obstacles. It is not possible accurately define the range of a Wi-Fi device. Vendors sometimes specify range based on a ‘clean’ environment (usually anechoic chambers) with values not reflective of a real-world deployment. Wi-Fi range is a two-way street. It goes from AP to client and vice versa. Range can be manipulated and improved by utilizing various technologies, antenna options and proper planning. Wi-Fi operates within the microwave frequency portion of the electromagnetic spectrum. Electro…what? This is just a fancy-sounding term to describe all known frequencies of electromagnetic radiation. 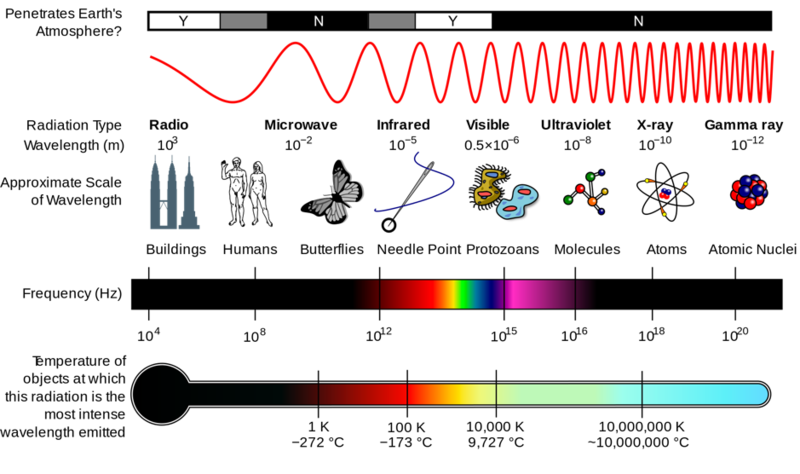 Visible light, infrared TV remotes, Microwave Ovens, X-Ray machines, and more all operate within this spectrum (at different frequencies). As such, a Wi-Fi access point is similar in behavior to a light bulb. How far does light travel? I would hope your response is ‘well, that depends!’. Exactly! Why does light from a lighthouse travel far? It’s powerful, highly directional and there are usually no obstructions. Compare that to a living room lamp: low-power, omnidirectional (the light is focused equally in all directions), and it is usually blocked by walls and obstacles. Let’s apply this principle to Wi-Fi. If your Wi-Fi radio is outputting at full power (increasing output power is called active gain), using highly directional antennas (focusing energy using antennas is called passive gain), with no obstructions, the signal will travel far. Conversely if the AP has omnidirectional antennas, operates at a lower power, and is surrounded by obstructions… you get the idea! Wi-Fi is subject to the same physical limitations as all other inhabitants of the electromagnet spectrum (including a light bulb). This includes: absorption, reflection, refraction, scattering, diffraction, and Free Space Path Loss (FSPL). All of these nasty evils impact wireless transmission range, so let’s take a closer look at each one. Turn on a speaker and position it next to you. The sound is clear. Now, put a pillow between your ear and the speaker. The sound is absorbed and the quality of the signal is degraded. Wi-Fi signals encounter exactly the same type of attenuation. The most common form of absorption is water. Can you think something that contains lots of water? You! People are one of the most common sources of signal absorption, unfortunately, this effects Wi-Fi. Reflections occur when a signal strikes a smooth object and bounces at the same degree the object was struck. You might think signal reflection sounds bad (and it used to be). Thankfully, with the introduction of 802.11n Wi-Fi, signal reflection (known as Multipath) is actually a good thing. 802.11n radio receivers are capable of translating multiple signals arriving at different times (caused by reflection), reducing the impact that reflections once had and turning them into a performance gain. Unfortunately, reflections still negatively impact wireless range. Refraction is when the direction of a signal changes as it passes through an obstacle. The best way to visualize this is a light prism. During this process, the strength of the original signal is reduced and subsequently so is the potential range. Scattering occurs when the originating signal strikes an uneven surface, the resulting weaker signals are reflected in multiple directions. The weaker signals will have a reduced range of the original signal. This occurs when a signal bends around an object or spreads through an opening. This often occurs in an environment with lots of pillars. The most relatable analogy of diffraction is water. If you push water through a gap, the waves will spread through and outward (see below for an illustration). Signal attenuates over distance. In the same respect that light travels so far before dimming, microwave signals used in Wi-Fi travel so far before the power of said signal is degraded and fades over distance from the source. This is an RF term used to describe the curvature of the earth. Quite simply, after about 7 miles the curvature of the earth starts to block line-of-sight and as a result, impacts RF propagation. Wi-Fi signals do not travel in a perfectly straight line, they reflect, refract, diffract etc. 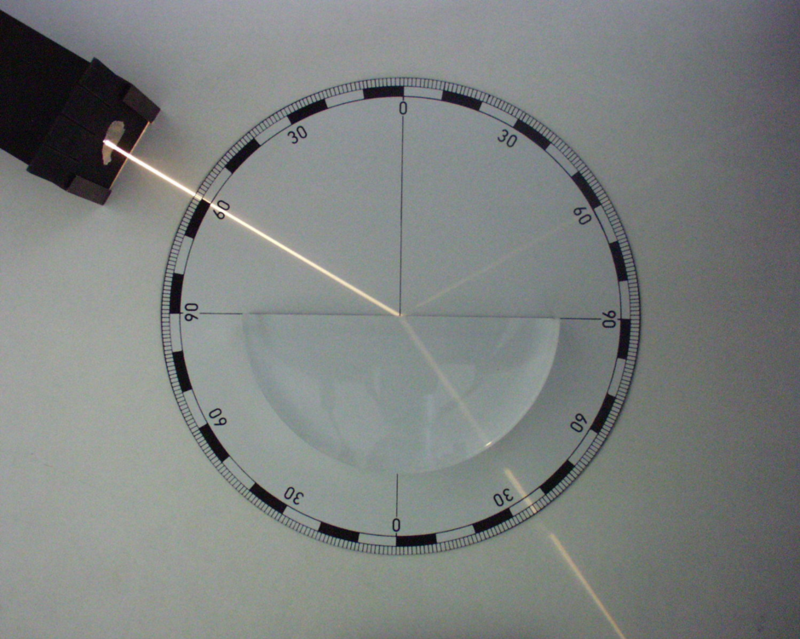 Because of this, the actual signal transmitted between two points is not straight, but closely resembles something cylindrical in shape (see below). Now that you know what each of these terms mean, you hopefully have a basic understanding as to how these factors are to detriment to Wi-Fi signals and as such, reduce range. Unfortunately, most of these hindrances are out of our control and there is little that can be done to circumvent them. 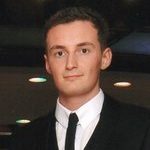 What can you do to improve range? Let us now look what we can do to reduce attenuation and some configuration options available and some technologies and standards utilised to improve Wi-Fi range. The most important consideration and easiest way to improve Wi-Fi range is to understand your environment. For example, avoid placing APs next to reflective objects such as metal surfaces and behind thick walls that will absorb signals. When deploying a point-to-point link, consider earth bulge and opt to achieve line-of-sight that takes into account the Fresnel zone. Before deploying Wi-Fi always conduct a site survey. The higher the power output of your radio/antenna, the louder your AP will ‘shout’ and the further the signal will travel. In Wi-Fi, this is represented by a figure called dBm (the ratio in decibels of the measured power referenced to one milliwatt). Just remember, increasing the output power of an AP too much can have an undesired effect. Your clients may not be able to talk back at the same power. You may also encounter roaming issues and hidden node problems. You are safer to enable Transmit Power Control (802.11h) or define output power to match your client device capabilities. RF Antennas come in various shapes and sizes but they all serve the same purpose; manipulate and focus the radiated energy to achieve desired coverage. The main antenna types are directional and omni-directional. As mentioned previously, omni-directional antennas have a distributed radiation pattern similar to that of a circle (equal in all directions). Because of this, the energy is less focused towards any specific direction and instead designed to cover a broad, undefined area. Conversely, directional antennas focus the radiated energy toward a defined direction. These antennas are typically used to form point-to-point links, cover outdoor areas, narrow passages such as isles in a manufacturing environment etc. Pick the right antenna for your environment. 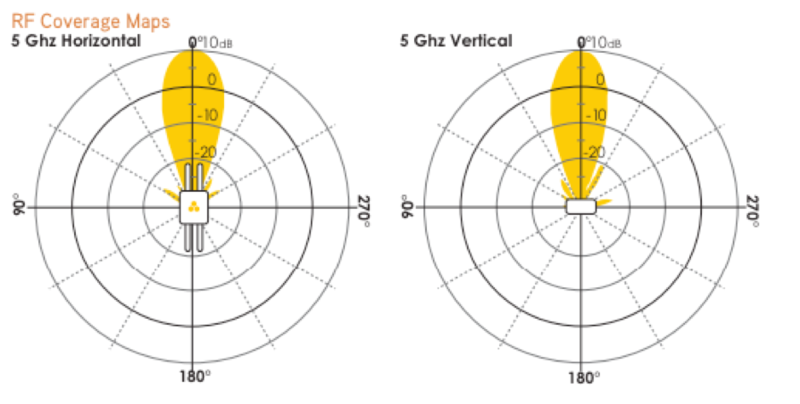 5GHz RF Coverage Maps for an Aerohive AP230 (omni-directional). 5GHz RF Coverage Maps for an Aerohive Directional Antenna. Transmit Beamforming (TxBF) has recently become standardized in 802.11ac and essentially works by more effectively focusing the transmitted energy toward a client’s location*. An added benefit of this improved signal concentration is greater range. * Using spatial streams for TxBF can reduce effective data throughput. There are a plethora of technologies and techniques used by various vendors, most of which are similar. The most common of these is sometimes referred to as smart/intelligent/dynamic antennas. These antennas are designed to focus their energy (with techniques such as polarization diversity) on-the-fly, usually on a per-packet basis. Think of this as an omni-directional antenna capable of changing to a directional antenna in real-time (it’s not quite that effective, but you get the idea). To answer, these figures should not be taken too seriously. They are usually recorded within an anechoic chamber where most of the aforementioned environmental factors that affect RF range are removed – the values are in no way reflective of real-world measurements. It’s also worth mentioning that simply recording RSSI (received signal strength) values between two Wi-Fi devices does not necessarily demonstrate effective range (unfortunately, this is often the method used by benchmarks). When a Wi-Fi device advertises itself, it broadcasts beacons. The receiving device uses these beacons to interpret the signal strength of the transmitter. The problem is that some vendors have configured their APs to broadcast these beacons at a higher output than the actual data frames. This means to the client, it appears as though the AP is capable of greater range. Conduct a throughput test however and you’ll uncover the nasty truth! In summary, it is not possible to accurately define the range of a Wi-Fi device as it will differ in every environment (to evaluate your environment, it is strongly recommended to perform a site survey.) and some devices will give a skewed output. The most effective way to record range is not RSSI recordings, but throughput tests. It is also worth noting that performance over range can be improved by reducing background RF noise. This can be measured by recording SNR (signal-to-noise ratio). Plan ahead; conduct a site survey. ** Increasing the output power of an AP too much can have an undesired effect. Your clients may not be able to talk back at the same power. You may also encounter roaming issues and hidden node problems. You are safer to enable Transmit Power Control (802.11h) or define the the output power to match your client device capabilities. 1) How Many Devices Can My Access Point Support? 2) What Is The Range Of Wi-Fi? 3) How Do You Gauge The Real Speed Of Wi-Fi?